A man has been jailed for six years for fatally attacking a man who was on a night out with his girlfriend in a bar. Anthony Condron, 29, was assaulted at Maya in Wood Street, Liverpool at about 01:00 GMT on 3 February. Paul Byrne, 23, of Mossley Hill, had admitted manslaughter at an earlier hearing at Liverpool Crown Court. Det Insp Elaine Coulter of Merseyside Police said the case was a "stark reminder" of the "devastation that can be caused by senseless violence". 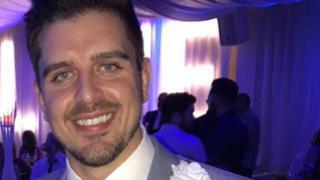 "Anthony was simply enjoying a night out which tragically resulted in the loss of a much loved son, boyfriend, brother and friend," she said. Mr Condron died in hospital shortly after the early hours attack. In a statement, his family said: "We would now ask for our privacy to be respected as we turn to the task of rebuilding our lives and honouring Anthony's memory." Two men were previously acquitted of manslaughter by a jury although one was jailed for 16 months for inflicting grievous bodily harm on a second man.